“Let nature be your teacher,” wrote the English poet William Wordsworth. I agree. Over the years we’ve learned a lot from Mother Nature’s River Academy – a curriculum with everything from beginning courses to advanced placement. As recreational paddlers, my wife and I have rivers to thank for some great life lessons. We got our Lewis and Clark exploring spirit from canoeing the Kickapoo River. Mother Nature carved out Wisconsin with her Ice Age glacier, but left the Kickapoo Valley to her wriggly apprentice – the Kickapoo. The 100-mile pretzel was a mapmaker’s nightmare but a classic what’s-around-the-bend trip waiting to happen. In Algonquin, “kickapoo” means “One who goes there, then here,” and paddling this giant corkscrew wound us past sandstone cliffs, farm fields, marshes and wooded shorelines where wildflowers sprouted between the toes of 100-foot Canadian hemlock. Our river map was no Captain Clark parchment scroll. It was a Xerox, and we counted bridges for our whereabouts. But our exploring itch to find new rivers to paddle was scratched, along with a curiosity about boats. For example, we learned that a kayak could be paddled upstream through rapids and then paddled downstream again. Other rivers that brought out our exploring spirit included the Namekagon and the Red. Peace of soul and good tidings can also come from rivers. The Wisconsin River from Sauk City to Boscobel, with its islands and sandy beaches, was like the Caribbean in some places and in others like the Rhine River, but without castles. On our August paddles we “let the cares drift away like the leaves in autumn.” Farther north, meanwhile, the quiet wilderness of the Rainbow Flowage cleared the digital detritus from our besieged brains. Not that our Wisconsin River trips were all meditative quiet water. Most rivers have multiple personalities. We’ve paddled the Wisconsin in 40 mph headwinds and driving rain for six hours. We’ve also enjoyed the roaring rapids at the Wausau Whitewater Park, where the runoff channel was transformed into a World Class whitewater slalom course for international kayak racing not 10 feet from shore. The Wisconsin was also a window to heartland Americana. One rainy afternoon, we skipped paddling and walked into a riverside pub where patrons were flinging dollar bills at the bartender. Then, at an appointed time, the crowd surged outside to a fenced-in, 8-foot by 10-foot wooden checkerboard with numbers painted on the squares. Seconds later, the bartender emerged carrying a chicken, which he dropped on the checkerboard. The square it pooped on decided who won the pot. Our other peaceable paddling passages included the Black, St. Croix, Chippewa and Tomahawk. I remember them as pleasant dreams, without details, but with good feelings. Unfortunately, Mother Nature was moody when we paddled “Old Man River.” Our one-foot-deep in mud Mississippi River launch from Oquawka, Illinois, into the murky backwaters and mysterious islands – where we spotted a helpless egret snagged in a fisherman’s drop line – left a gloomy impression, different from our Bemidji and Lake Pipen trips. Mother Nature taught us you don’t have to be artists to savor beauty. The Bois Brule, with its quintessential northwoods splendor, taught us new colors and compositions (like framing Hogarth curves with tree canopies) and classic portraiture: a shaft of sunlight illuminating a cinnamon colored doe, neck-deep in ferns and peering at us with curious eyes. We learned elements of light, contrast, and angle from her art exhibits. Some rivers are require tough love. Wisconsin’s Wolf River was one. Come spring in pioneer days, lumberjacks in double-ended boats (bataux) and armed with harpoon-like “peaveys” drove giant white pine logs down the icy spray of the Wolf to the sawmills, stalking their prey through the raging surf like Captain Ahab after the great white whale. Our Wolf entree was more sedate. He drifted down the gentle sections of the bronze colored river on a floating waterbed (a raft), gliding past blowing pines that combed morning sunlight across rippling waters, while below, spurts of tiny trout stirred sand clouds in the pebbled streambed. We drifted downriver on a floating waterbed. Then, on hefty rapids – Boy Scout, Hansen’s and Gilmore’s Mistake – we learned Hooke’s Law: an elastic body bends out of shape in proportion to the stress acting upon it. Our flexible craft adapted like a kitchen sponge, squeezing between boulders, bonking off rocks and noodling down watery staircases like a slinky toy. The Wolf was love at first sight and became our basecamp. We hauled our kids, their friends, two dogs and a great jumble of camping gear to Langlade, Wisconsin, in our orange Volkswagen bus. Those were the idyllic days before lyme disease, heartworm and West Nile virus, camping on beautiful Boulder Lake before it was wool-to-wall outboards. Not that camping was all honey and roses. One night, bone tired from paddling, we passed out early. At midnight I sat bolt upright in my sleeping bag to gunshots popping outside our tent. Pulling back the tent flap, I spied a roaring campfire at the next campsite surrounded by a boisterous crowd of beer-drinking bikers. I flopped back in my bag in exhausted slumber. The next morning when we awoke, the entire campground had cleared out except for the bikers next door who lay sprawled and snoring in a sea of beer cans. There was no harm done, but the outhouse smelled like one of Dante’s Circles of Hell. We left without a goodbye. Kayaking the Wolf, Ms. Nature’s AP whitewater course, was not much like floating on a waterbed. During three heavy duty, water soaked days of kayak basic training in full battle dress (wet suit, pogies, helmet and skirt), we learned everything from eddy turns and wet exits to river rescue and the Eskimo roll. Basically the river taught us what it was like to be “engaged,” crisscrossing downriver shoelace style, hunting safe harbors (eddies) downstream of rocks to recoup before tracking our kayak instructor like ducklings after mother duck. Kayaking the Wolf, our first whitewater high, was a hydraulic anthology: We paddled rollercoaster rapids; short, bucking rapids; rapids that swooped downhill like ski slopes; and rock-studded washboards. It was exciting, like skiing your first run down a powder slope, running your first 10K or playing Bach’s Ode to Joy for the first time on a classical guitar. There were also innocent looking, swishy rapids swirling root beer foam around moss-capped boulders. In August in low water, it was easy to hang up on rocks. One time, rafting with two neighbor families, one dad-daughter raft lodged on a rock. The teenager stepped out into ankle-deep water, but when her six-foot-six dad climbed out, he sunk over his head and losing his asthma medication so his throat closed up like a cocktail straw. It was six hours to take out in those days before we had cell phones with which to call for help. Our friends were both MDs. Jack, a general practitioner straining to breathe, gasped, “Harold, what should I do?” Harold, the gastroenterologist, said, “Jack, I only work from the waist down.” The laughter eased the journey to the take out. Jack recovered after a week in the hospital. The story, now a neighborhood legend, was nevertheless a teaching moment. Although the Wolf was one of our top three adventure rivers, it taught some hard lessons. After our first day rafting, we waited in line at a restaurant to call home. The caller ahead of us was informing the party on the line that their son drowned rafting. We paddled other tough guy rivers, too. Our canoe was no match for the rooster tails on Wilson’s Rapids below McClintock Park on the Peshtigo. The rooster crowed and we nosed over on wave four, swimming against the current while our field glasses and camera bobbed along in their flotation bag, next to our paddles. Happily, they snagged in the shoreline grasses. The Peshtigo was in flood stage our first time rafting its most difficult rapids. We were already a mile downriver when the outfitters pulled all the rafts off the water. During our free fall over Five Foot Falls, our raft spun out like a flying saucer. Had my wife not grabbed my belt, I’d still be in orbit. The Oconto bounced us down her Class IV Bagley Rapids like a rubber ball. Our only Oconto problem was a farmer’s dog with teeth bared like Jaws that charged the riverbank and pulled up, snarling, just two feet from our raft. Later we slept next to Bagley Rapids to the soothing sounds of rushing water. The Ion Effect theory maintains that negative ions from falling water create a feeling of well being. It makes me think of singing in the shower, honeymooning at Niagara Falls and … Bagley Rapids. But the Wolf also taught us about meeting challenge, and the spill-over of “Can Do” spirit. If Ben Franklin was asked about the Crystal River, he might have said, “The Crystal River is proof that Mother Nature loves us and wants us to be happy.” The Crystal taught us how to be children again and laugh 400 times a day. We launched at Ding’s Dock, an outfitter since 1946, aboard a canopied motor launch pulling a “V formation” of canoes across the Chain O’Lakes. We sat with paddlers wearing everything from swimming suits and cowboy boots to designer jeans and Adidas. However, sans pier we had to jump overboard into the Crystal’s headwaters and were submerged again climbing into the, wobbly shell canoes nicknamed “peapods.” But despite the soggy entrance, we were soon skimming the gently flowing waters – until we deadheaded into the rock garden, a maze of boulders and fallen trees. We bounced off rocks, ducked under limbs, swept around fallen logs, shoehorned ourselves through narrow chutes of water and scraped against the odd boulder. The big surprise was that the quirky stream was less than a foot deep, calling for more freestyle and finagling than by-the-numbers canoeing. Sawed off “J” strokes in six inches of water made us look like Keystone Cops in a canoe. Our world’s funniest river bloopers included floating broadside, doing 360s on submerged rocks, and the time I grabbed a branch over my head to steady the boat. With water poured in the stern, we sank to the bottom. That was a true ‘go-with-the-flow’ lesson. Later, as the river widened, passing from woods into marshes and meadows, we glided in silent parabolas on lazy, chestnut brown flatwater, paddles at parade rest, watching the cedar waxwings and dragonflies. Other times we hugged the spongy banks elbow-to-elbow with the cattails, floating near the homespun trampolines of upscale spiders with riparian rights. Paddling some rivers was traveling a Xeroxed shoreline. On the Crystal, every mile was new, including cottages, manicured lawns complete with lawn ornaments, and farmland. We waded in the sparkling, clear spring water on a clean pebble bed, where brown trout cruised like wide-mouthed zeppelins and minnows nibbled our toes. We stopped at the town of Rural, and strolled through what resembled a Norman Rockwell magazine cover. Ice cream cones still cost only a quarter. But Rural wasn’t without fame. Crystal fisherman Dudd Carr won the international fly fishing contest at the 1893 Chicago World’s Fair. Without Wide World of Sports, DVDs or sponsors for his feather-light, pinpoint casting, he hopped a freight back to Waupaca and hoofed it home to Rural. The Crystal was a lexicon of bridges: gleaming steel bridges; covered bridges; shaggy old timber structures; half-moon metal tubes; splendid spans of arched redwood with handcrafted trestles; bridges with piers that bisect rapids (and canoes); and bridges that doubled as recreation centers with drop lines and gym shoes visible from below. Paddling under bridges brought clammy, gurgling darkness, graffiti in moss and eerie echoes. Sometimes a scruffy, cheese-eating Wisconsin troll popping up from the dark pool, rolling his eyes and drumming his hairy fingernails along your gunnels. Don’t worry, it’s just your teenage daughter’s boyfriend. In one sense, the Crystal bridged the generation gap. Parents and teenagers, teachers and students, scoutmasters and scouts all shared three wet-and-splashy hours in a peapod and ended up connected. One family rented 30 boats for their annual reunion river trip. We witnessed the ritual bonding of Boy Scouts and scoutmasters on the Crystal. Upstream two scoutmasters paddled serenely downriver, but gliding out from under the Rural Bridge, they were ambushed and catapulted into the water while other scoutmasters, dripping wet, cheered from the shore. It was reminiscent of tossing the swimming coach in the pool after winning the state meet. Parfreyville Rapids, a.k.a. “Mother Nature’s washing machine,” was the Crystal’s most challenging rapids – a white-knuckle ride through a gauntlet of canoe-thumping boulders with a rinse cycle. After our wipeout at Parfreyville, we waded ashore to watch the canoe calamities of others like the audience at a mud wrestling or pie-throwing contest. At trip’s end we splashed ashore, our whole bodies wrinkled like dishpan hands, our souls splashed with laughter, friendships renewed, and giddy with the feeling of what it was like to be a child again. In Colorado, mountain climbers can buy “Fourteeners” T-shirts with names of the 54 peaks over 14,000 feet high. As recreational paddlers, we were privileged to travel nearly as many rivers. We didn’t get T-shirts or degrees from our river classes, but Mother Nature 101 taught us about the sense of wonder, the tonic of wilderness, and the spirit of adventure. Bob McCray was a community college journalism teacher and writer who passed away in July. 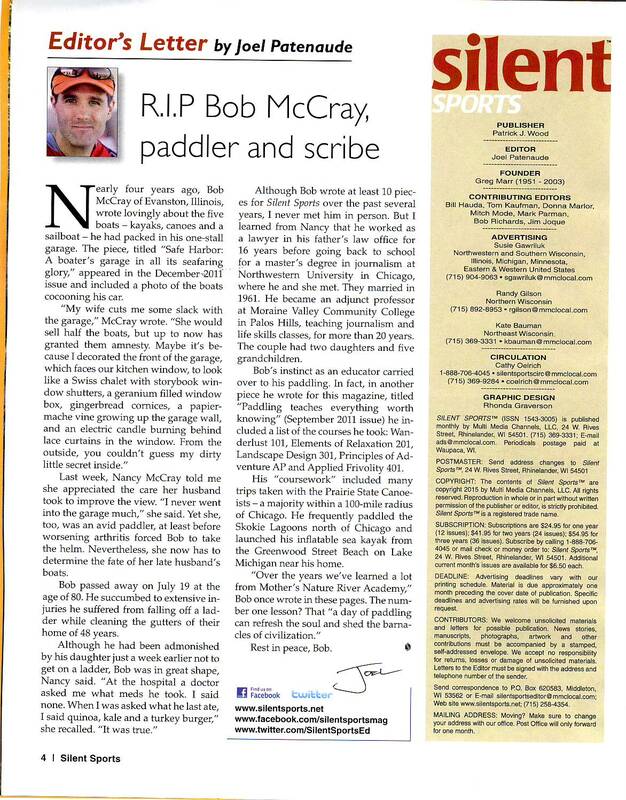 Read Joel Patenaude’s, Editor of Silent Sports, memoriam to Bob below. Thank you Joel, for permission to reprint this wonderful article.